Copper ornaments fashioned for a ceremonial garment. Shaped and hammered copper sheet with perforation holes for attachment. Central half-moon shaped backflap segmented in three pieces. 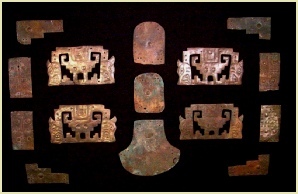 Four separate double headed Jaguar repousse motif focalized around a humanoid figure. Eight additional rectangular and step shaped parcels. Arranged in a 12"/30.48 cm by 16"/40.64 cm by 3”/7.62 cm. black shadowbox glass display case. Restored 2005. Very Fine Condition. Chimu, Upper Moche Valley region, Peru. ca. 1100-1450 AD. Comprised from 98.9% copper, 1.03% tin and .07% zinc. Extremely rare for its entirety - Valued personal ornaments of a highly ranked Chimu warrior priest. The elite society distinguished themselves by wearing fine clothes and elaborate paraphernalia of rank and ritual.